Hail Caesar! Our take on the classic Caesar salad has everything you would expect in a Caesar salad, plus a few extras. BRUSH both sides of tortillas with salad dressing. Invert a medium -size glass plate and shape each tortilla over plate. Microwave on HIGH for 2 minutes. Rotate plate; microwave on HIGH 1 to 2 minutes longer until crisp. Cool on wire rack; remove tortilla from plate. 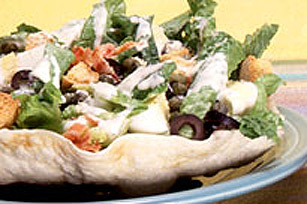 LINE tortilla "plates" with lettuce; attractively arrange eggs, bacon, olives and capers on lettuce. Sprinkle with cheese and croutons; drizzle with dressing.